SIC Tour : Limited departure , tour prices are based on a minimum of 4 participants. If less than 4 persons are booked, we will inform you 28 days before departure. You will be given the option of proceeding with the booking by paying the applicable surcharge or cancel free of charge. Depart from bangkok to Pakchong, Nakhon Ratchasimawhere “Khao Yai” , the second largest national park in Thailand is located . It covers an area of 2,168 square kilometers, including evergreen forests and grasslands. We will take jungle trekking in the real jungle . where you can see 3,000 species of plants, 320 species of birds like red jungle fowl and green peafowl and 66 species of mammals, including Asiatic black bear, Asian elephant, gaur, gibbon, Indian sambar deer, pig-tailed macaque, Indian muntjac, dhole, and wild pig. After picnic lunch, visit Heo Narok, and Heo Suwat made famous from the film The Beach. Late afternoon transfer you to overnight at hotel. We drive to the heart of the north east where the culture and historical attractions are waiting. Here it looks if time stood still. 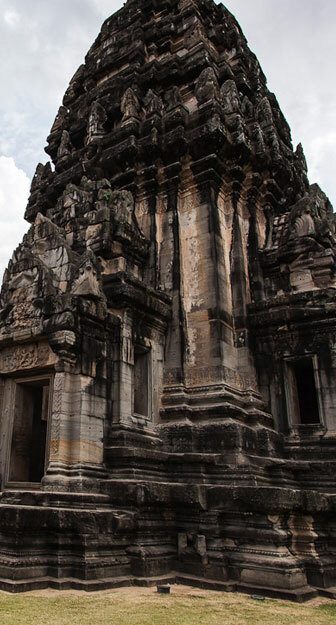 In the small towns of Dan Kwian and Pak Tong Chai, We will visit a few factories where people still use their skills to make handmade pottery, continue Phimai Historical Park where we visit the beautiful Khmer ruins that were built in the same style as Angkor Wat in Cambodia, this area once belonged to the same country. We will have a traditional lunch at a 500 year old holy tree which is as big as a whole forest. In the afternoon drive to Khon Kean, the capital of central northeast of Thailand. After dinner, enjoy shopping at the walking street. After breakfast, we will transfer you out across the border to continue trip in Laos or transfer you to Udonthani where catch the flight back to Bangkok. Our package prices are inclusive of transfers and tours by air-conditioned car/minibus/coach with English speaking guide, baggage handling, entrance fees, meals as specified in the program (full-board), accommodation in air-conditioned room with shower/bath), service charges and VAT. Note: Small deviations in the tour program are sometimes necessary, depending on road conditions and availability of rooms.